On May 25, 1979, Flight 191 lost some parts of its engine as it was taking off and flipped on the runway. It exploded into a huge fireball, killing all the crew and passengers aboard and 2 people on the ground. Shortly after, folks reported white lights moving around in the crash site. Folks who lived in an adjacent mobile home park said within hours of the crash, they got knocks on their doors and windows, but no one was there. The knocking went on for months, and then their doorknobs beagn to turn. Some residents opened their doors to find a person standing there, saying he needed help to get his luggage or make a connecting flight. A resident walking his dog reported that a young man came up to him, smelling like gas and smoldering, and said he needed to make an emergency call. Then he disappeared. Moans and crying have been heard coming from the crash site as well. Actually Flight 191 did not flip on the runway and crash as stated. Instead, it had just taken off and was briefly in the air when one of its engines broke off and the plane dove into the ground. My parents were at O’Hare at the time awaiting takeoff to Tennessee when it happened. They saw it all. Exactly! AA 191 lost not just parts of an engine, but an entire engine and part of the leading edge of one wing. Moreover, it was about 4600 feet beyond the runway threshold when it crashed into a vacant field adjacent to the trailer park. From now on, this is my pursuit. I used an emf the other night by the site and I smelled a faint smell of mechanics engine oil and the meter went up to 272 which is a very high reading. I’m going back to the location soon. I lived in that trailer park until I was 7. We moved out of there about a week before the crash happened. My mom heard about it on the news and told us. American Airlines Flight 191 was a regularly scheduled passenger flight from O’Hare International Airport in Chicago to Los Angeles International Airport. The McDonnell Douglas DC-10-10 crashed on May 25, 1979, moments after takeoff from Chicago. All 258 passengers and 13 crew on board were killed, along with two people on the ground. It is the deadliest aviation accident to have occurred in the United States. Investigators found that as the jet was beginning its takeoff rotation, engine number one on the left wing separated and flipped over the top of the wing. As the engine separated from the aircraft, it severed hydraulic fluid lines and damaged the left wing, resulting in a retraction of the slats. As the jet attempted to climb, the left wing stalled while the right wing, with its slats still deployed, continued to produce lift. The jetliner subsequently rolled to the left until it was partially inverted, reaching a bank angle of 112 degrees, before crashing in an open field by a trailer park near the end of the runway. The engine separation was attributed to damage to the pylon rigging structure holding the engine to the wing caused by faulty maintenance procedures at American Airlines. While maintenance issues and not the actual design of the aircraft were ultimately found responsible for the crash, the accident and subsequent grounding of all DC-10s by the Federal Aviation Administration added to an already unfavorable reputation of the DC-10 aircraft in the eyes of the public caused by several other incidents and accidents involving the type. The investigation also revealed other DC-10s with damage caused by the same faulty maintenance procedure. The faulty procedure was banned, and the aircraft type went on to have a long passenger career. It has since found a second career as a cargo airplane. The first rigs on the scene were the airport foam trucks. The next unit was Truck 128 from Elk Grove Village. I was driving the truck that day and do not remember seeing anyone else.there.. I was just leaving O’Hare Airport after dropping my friend off at work. I was driving away from the terminal back towards the highway. I could not believe what I was seeing off in the distance behind the airport. A huge black mushroom type cloud rising up into the sky. 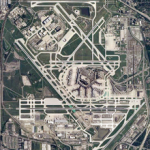 What you probably saw were the routine fire drills that they do at O’Hare. The have a controlled fire that they practice putting out. Large plumes of black smoke reach high into the sky. If you didn’t know this, then it could really freak people out. I’ve landed at ORD during one of these drills, and the pilot announces this fact so people don’t worry that something horrible happened. I was not around when the crash happened. I currently live in the mobile home park right next to the spot. I have noticed some activity, but not alot. I have a security system in my mobile home and I have to be careful when it’s armed because it registers that the front door opened/closed within a second and sets the alarm off :-/ I can’t use the motion sensor because it sets the alarm off. I lived there in the early 90’s. I had many things happen to me while living there, and was not aware of the plane crash right next to the park until a couple of months before I moved out. I lived there for a little over a year and had things happen almost immediately after I moved in. I would wake at night hearing a female ask for help, someone would knock at the door and no one would be there (this happened all the time and I just figured it was kids until it happened when I was next to the door and opened it right away with nobody there). I would hear and feel footsteps in the trailer at one end, then go to investigate and it would come from the other end. There was one room that I used for storage that I hated going into. I would keep the door closed and only went into the room if I needed to get something, usually getting chills when walking into the room. Two nights in a row I fell asleep on the couch watching tv and was woken up by a sharp pain in my mouth like I had bit my tongue and tasted burnt meat (it was very weird). I also felt like someone was on top of me trying to hold me down but could not see anyone, this happed two nights in a row. Dishes would move around in the sink, things would disappear, only to show up again a couple days later. One night the power went out in the park during a storm and while I was sitting on the couch a blue ball of light started to form in front of the door of the room I was uncomfortable going into. The ball of light was about chest high and slowly got bigger, at that point I decided to leave for the night and didn’t return for a couple of days. I had a strong sense that there were two ghosts there, a woman who was nice and maybe confused and a man who was angry and perhaps a salesman or business man, and was not a nice person in life. There were many more things that happened while I lived there. 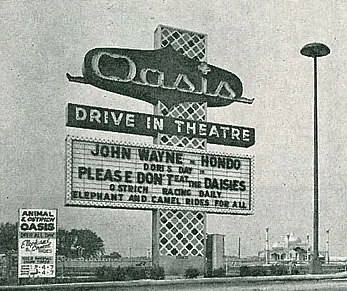 I just found out today that the Oasis Mobile Home Park used to be a drive-in theater, from 1960-1973. I guess the retro signage is a relic from that era. If a plane were to crash today in the approximate area as AA191 did, it would crash into a field of monolithic tanks. Not sure what’s in them, though. Not fuel, I hope. A boy in my class died in this crash, along with his parents and brother. It’s hard to believe it’s been 40.years.